About 1 ½ miles from Greenwich’s Field Point on Great Captain Island. The Greenwich Parks Ferry provides access to the lighthouse and the surrounding grounds from the ferry dock on Arch Street. 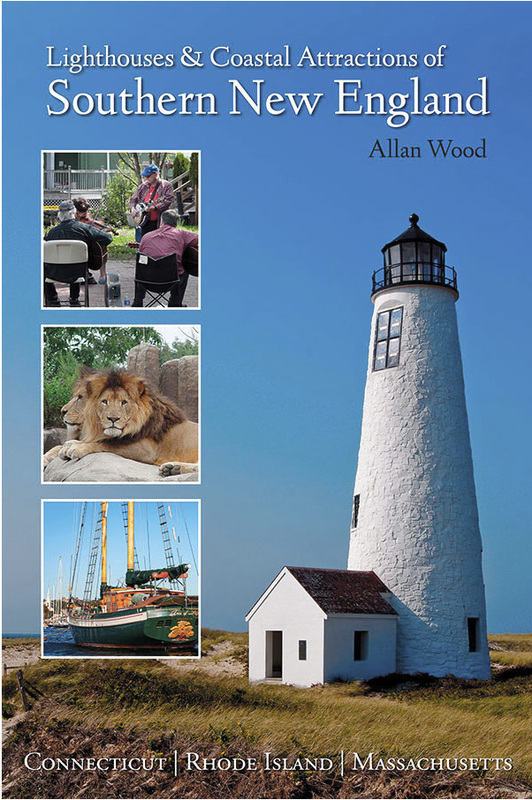 The island is open to the public during the summer months and lighthouse grounds are open to the public. Here is the case where the government purchased the land before the actual site selection was made. 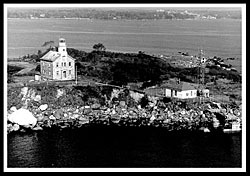 When the Great Captain Island lighthouse was built in 1829, there was dispute as to whether it was in Connecticut or New York. This dispute continued for nearly 50 years until the decision went to Connecticut. During prohibition days, the island was used by bootleggers to dilute smuggled liquor, which was then brought to the mainland for resale to many thirsty clients. Beginning in the 1920's, a private beach and casino was in full operation at the island for many years until it mysteriously burned to the ground one night in 1947. The owners sued the Coast guard, claiming it was lit from one of their flares while they were searching for a downed pilot. The Coast Guard paid the owners nearly $20,000 in damages in 1951. In the late 1990s, a fund raising campaign called “Return the Light” was developed to rebuild the lighthouse, which was in severe deterioration. Ben Fisher, who championed the cause, was one of the many killed years later on the attack on the World Trade Center Towers on September 2001. As part of the renovation, a bronze plaque with Fisher’s name, among 12 residents and 14 others who had ties to Greenwich, was placed on a rock near the lighthouse. Most were working at the Trade Center, which is a relatively short commute from Greenwich, and two were on the hijacked planes. Today Great Captain's Island is part of a nesting bird reserve and inhabits the largest concentration of white egrets in Connecticut. With Route I-95 or Route 1 near the coastline, most attractions are easily accessible from either route. Greenwich’s affluent community hosts a number of specialty shops, art galleries, and recreational parks for locals and visitors alike, along with summer concerts. With its location on the New York border near the Big Apple, visitors will find the drive enjoyable with many opulent and beautifully landscaped homes to admire. The Greenwich Point is a waterfront recreational park on a peninsula with clean sandy beaches, making it a popular spot for swimming, fishing, boating and water sports. Another beach includes the Byram Beach and Pool, which has the only public bathing pool in town, located by the water’s edge. For those who want fresh produce, the Augustine’s Farm, the only surviving produce farm in town, offers plenty of homegrown vegetables, eggs, and strawberries for visitors and locals alike. Greenwich hosts many recreational parks for locals and visitors alike, along with summer concerts. The Bruce Museum promotes arts and science to enrich those that visit. The Greenwich Parks Ferry provides access to the lighthouse and the surrounding grounds from the ferry dock on Arch Street, for quiet picnicking and a tiny isolated beach. Non-residents will need to purchase a daily park pass at the town hall, or other designated locations. There are no amenities on this island except for a water bubbler and half of this tiny 1/4-mile island is part of a wildlife sanctuary for nesting birds. It boasts as having the largest population of white egrets on the coast. It's like having your own private island, very quiet except for the thousands of birds. Great Captain Island view from the lighthouse tower. The views of shoreline mansions as you head out on the ferry from the harbor to the island are also quite remarkable. From the West: Take US I-95 North, then take Exit 3 to Arch Street toward Greenwich, look for Greenwich Business District Signs. Locate the town hall to get your pass to take the ferry or you won't be allowed on. From Arch Street, turn right onto Railroad Avenue and the dock will be on your left. 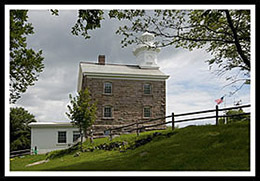 Take the ferry to Great Captain Island Lighthouse. The ferry leaves the Greenwich dock every hour, and picks up from the island every hour on the half (1:30, 2:30, 3:30, etc.). 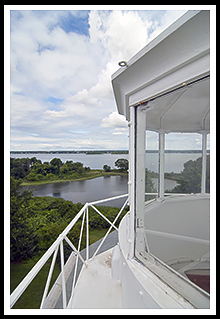 Provides access to the lighthouse and the surrounding grounds from the ferry dock. In addition to marine life study, seals, birding, and TGIF cruises, they offer two different Long Island Sound lighthouse cruises in the Spring. The one for Western Long Island Sound covers Greens Ledge, Sheffield Island, Stamford Harbor, and Great Captain Island.